Please read our website before you contact us. For tour information, please visit the THIS page. For general questions, please visit the FAQ page. 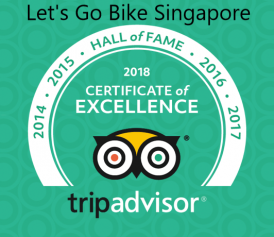 For last minute tours or hotel concierge booking, please call, SMS or Whatsapp +65 90044332 or send a message via our Facebook page. Problem finding? Call or Whatsapp: +65 90044332. Leave station via Exit B. You should see McDonalds on your right. Note: It takes at least 15-20 minutes from your hotel in the city area; longer if you need to switch train lines or if your hotel isn’t next to one. We advise that you leave your hotel 1 hour before your scheduled ride. Cost is about USD 1 per way. Ask driver to go to Block 462 Crawford Lane. After you alight, walk to the middle of Block 462. It is a curved block and we are in Unit #01-57 in the middle as indicated by the flag on the map! We are only 5 – 15 minutes by car from any hotel in the city area! Allow more time during peak hours. Cost varies with time/distance and should be around USD 5-10. We are also on Google Maps! Search for Let’s Go Bike/Cook or 462 Crawford Lane or post code 190462 and follow the directions!